Explanation: No asteroid or comet is known to be on a collision course with Earth. The asteroid designated 1997 XF11 had been predicted to come uncomfortably close, but new estimates place its passing beyond the orbit of the Moon. This earth-approaching asteroid was discovered by SpaceWatch astronomer Jim Scotti in December of last year. Orbital computations using new observations suggested that it would pass within 30,000 miles of the Earth's center on October 26, 2028 - a very near miss considering that the radius of the Earth itself is about 4,000 miles. However, more recent and further refined calculations based on both new and archival data indicate that the closest approach will be 600,000 miles in 2028. 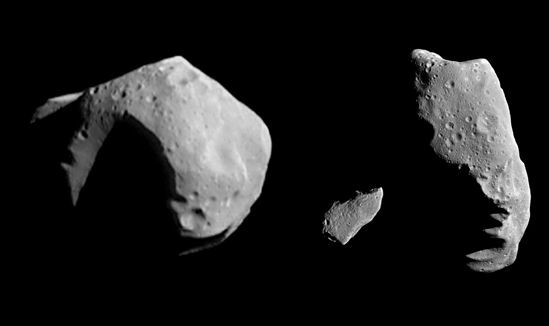 Imaged by NASA spacecraft, the three potato-shaped objects above are large main-belt asteroids orbiting between Mars and Jupiter. Shown to the same scale from left to right are Mathilde, Gaspra, and Ida. Mathilde has dimensions of about 37 by 29 miles. The asteroid 1997 XF11 is much smaller, probably a mile wide, yet the impact of an asteroid of this size could have catastrophic effects. Over the last two decades, teams of astronomers have just begun to catalog and track near-earth objects.